M0PLA/P SOTA Activations: 14th January 2017. Stiperstones SOTA Activation visit in the Snow. 14th January 2017. 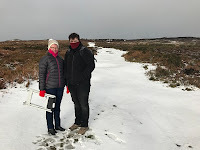 Stiperstones SOTA Activation visit in the Snow. G/WB-003 Stiperstones. 14th January 2017. First activation planned for 2017 was Long Mynd G/WB-005, followed by Stiperstones G/WB-003. 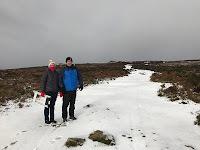 Bad weather had the roads blocked to the top of Long Mynd. I was not going to walk for a mile or more. So we turned the car around and headed towards Stiperstones. 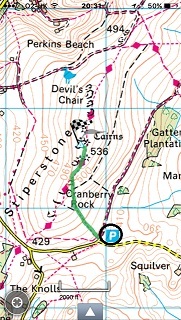 We arrived at around 10:30 a.m. at grid SO369977, The car park at the base of the Stiperstones. It started to snow within 5 minutes of arriving and we waited for a few minutes making sure it was going to be a safe ascent. After a slow walk of about 25 minutes (no broken ankles) we arrived at the summit, a quick photo session and I set up my gear, my wife and son that had accompanied me both disappeared to play in the snow. I only intended to active on 2M. I didnt want to risk carrying my 20M Moxon up in the snow. 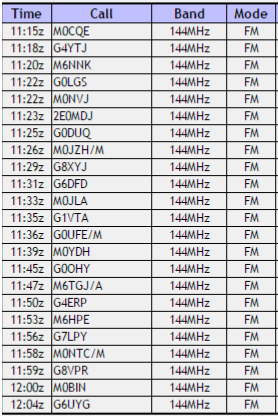 The activation's came in nice and fast with 23 QSO's in 50 minutes. This was about the time I had wished I had my Moxon. My work party had arrived back and poured a nice cup of coffee just in time to warm me up. Nice pics! What antenna did you use? Pity I missed you. 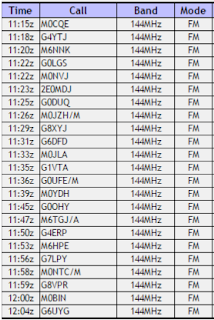 I am only using 2m FM vertical at the moment.